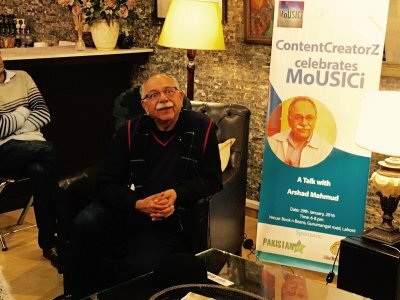 Arshad Mahmud and team MoUSICi were invited for a talk by ContentCreatorZ. The event took place in Lahore. Arshad Mahmud explained that "MoUSICi is a platform which will actually help whole music community by bringing musical talents together on a platform.On MoUSICi,we will showcase work of the young artists who are really talented and produce good quality work. We will also be able to help the musical talent of our country by identifying the right people to help youngsters create new music. If for example you need a really good guitarist, we can suggest one. We can also help you to see if you need a guitarist for this particular composition or not." Arshad Mahmud said that "poetry and music are very closely related with each other. In olden days, it was the lyrics which attracted the attention of the audience and musical instruments added to the feel of it all. Nowadays, many instruments are added just for the sake of it. It's like the law of diminishing returns. When too many instruments are added, the arrangement sometimes back fires." Website, MoUSICi.com will be accessible to fans in next few days.